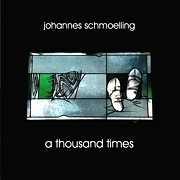 Johannes Schmoelling, who was a member of Tangerine Dream between 1980 - 1985, has released his latest album "A Thousand Times". Comprising eleven tracks (see track list below) it totals over 60 minutes of new, previously unreleased material. Tracks 1 to 10 were composed, performed and produced by Johannes Schmoelling between January and November 2009. The last track "Footsteps" is a bonus track which was composed, performed and produced by Jonas Behrens who is appearing on Viktoriapark Records for the first time.